Take the stress + guesswork out of your meal planning each week! 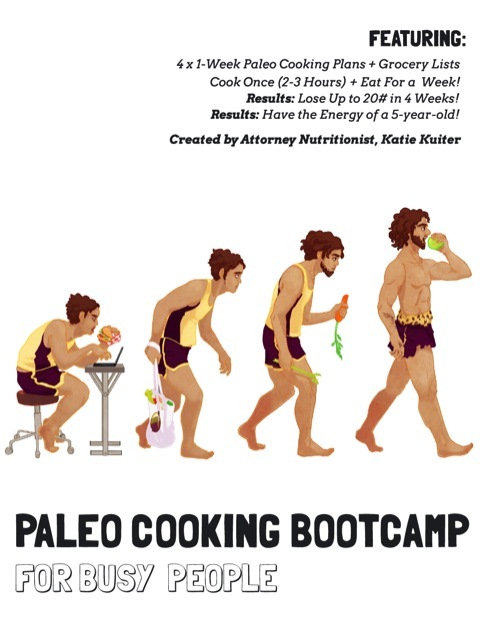 This e-book contains a month's worth of menus from my award-winning Paleo Cooking Bootcamp class. For each week, there is a Grocery List, a list showing what order to cook everything (the "Cooking Order" list), and recipes with step-by-step instructions + photos. All of the recipes for each week's menu can be prepared in 2-3 hours at home, which frees up your time to do more of the things you love to do! This e-book provides a systematized + stress-free approach to how you accomplish healthy eating each week! My clients who have followed this menu have also been able to lose weight effortlessly (up to 5# per week), and have all reported significantly better energy!